Create lifetime memories in Dolphin’s Delight. 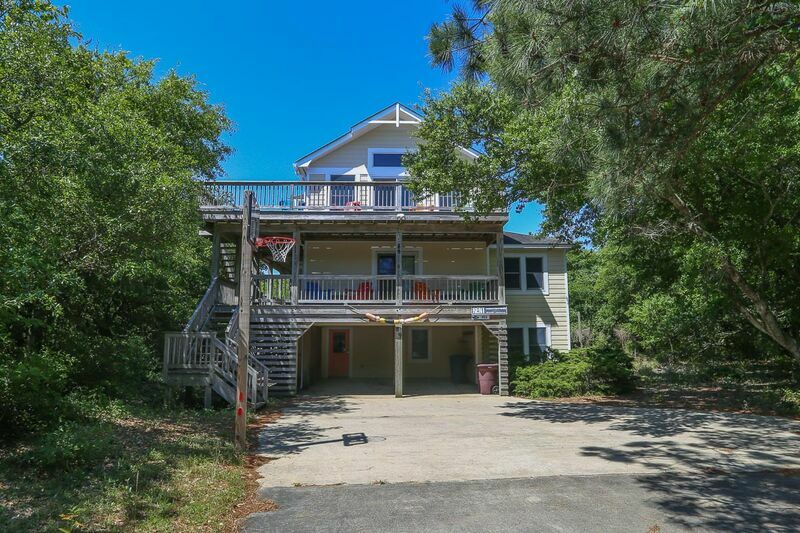 This five bedroom Outer Banks rental is located in the popular Southern Shores community of Chicahauk. Dolphin’s Delight has an open and airy living space with comfortable furnishings and features a private pool. This OBX rental is a short ride from Duck and Kitty Hawk shopping and dining. Bedroom (with Queen). Recreation room with 1 Queen sleep sofa, TV/DVD player, small refrigerator, full bath, laundry room. 4 bedrooms (master bedroom with Queen, TV/DVD player, deck access, private full bath: master bedroom with Queen, TV/DVD player, private full bath; 1 with Queen, TV/DVD player, shared full bath; 1 with 2 Bunk sets with TV/DVD player). Large living, kitchen, dining area with cathedral ceiling, TV/DVD player, stereo/CD player, game nook, powder room.